We always planned to attend the District 5SKS convention in Moose Jaw, Saskatchewan this year because it would be our first opportunity to thank those who supported my candidacy last year to be endorsed and elected as an international director. But, when Director Yves learned that he would not be able to officially represent LCI due to health reasons, Kathy and I were happy to step up and represent him and his wife Dominique this past weekend as the international guest for the convention. Our travel arrangements to and from Regina were flawless—beautiful weather, pleasant airline staff, on-time departures and arrivals—and when we arrived and departed, our hosts and very good friends—Lions Rob and Freda Hill—were there to drive us to and from Moose Jaw were the convention was held. 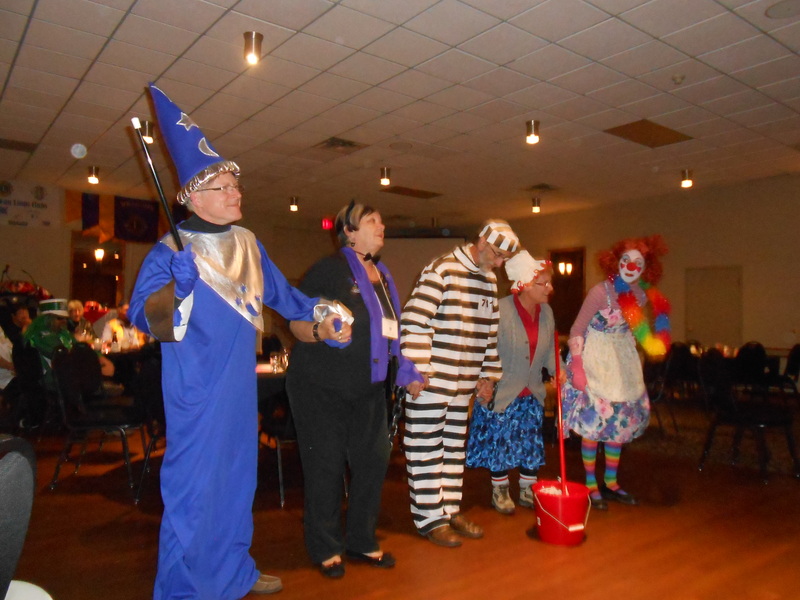 Our first event was a Halloween party. 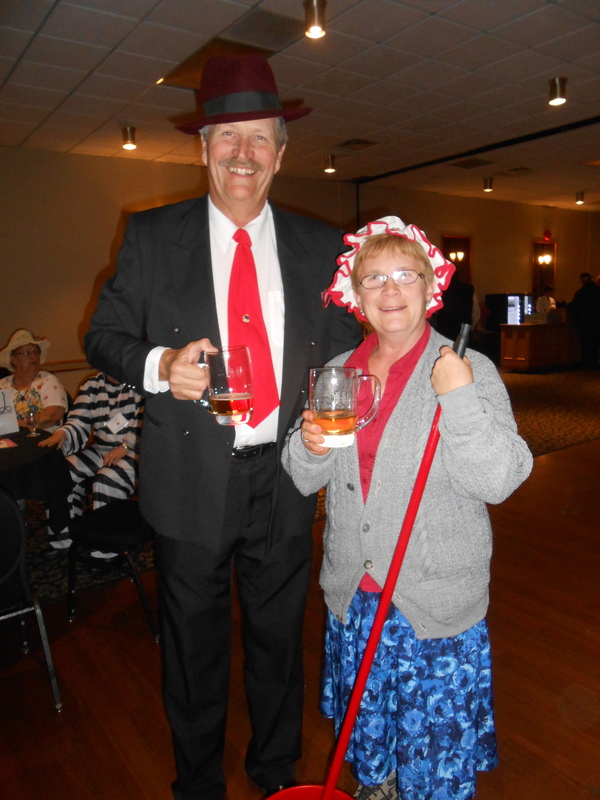 Kathy and I quickly donned our costumes and immersed ourselves in hugs and hand shaking, as we were warmly welcomed. The Lions of Saskatchewan are very warm and friendly to us and they let us know they were happy we were there. We participated in the skits and activities and had a great time and a good night’s sleep. 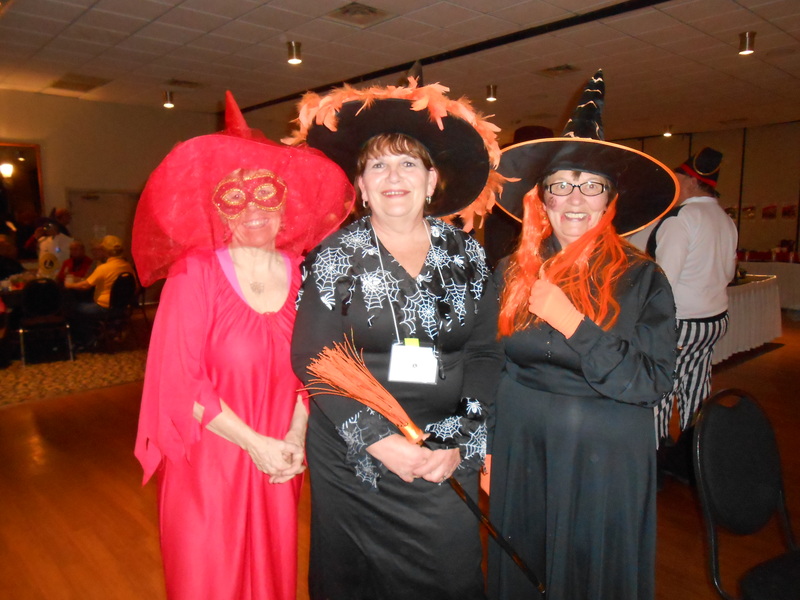 Kathy joins Barb Becker and Bev Zeigler. ID Robert joined 5SKS Lions in a skit about a hero, a heroine, a villian, a cat, and an elderly aunt. On Saturday, the programs began early and continued throughout the day. One thing I especially appreciated about the programming was the variety and pertinence of the topics to the Lions attending. The program presented by Past International Director Garnet Davis introducing the Centennial Service Challenge and other events being organized to celebrate the 100-year anniversary of the founding of Lions Clubs International in 2017 gave the delegates a glimpse into some of the great things that lie ahead for LCI. It’s really exciting for me to be part of the International Board at this time because planning for and publicizing an international celebration is an once-in-a-lifetime opportunity. Kathy and I found two special interest programs that involved Lions or family members of Lions of particular interest. Darla Peterson, (daughter of Lion Wayne McGregor) and her husband Trevor, presented one program describing their service in Rwanda as part of an international effort to rebuild the educational system after the genocide that decimated the teacher population 20 years ago. 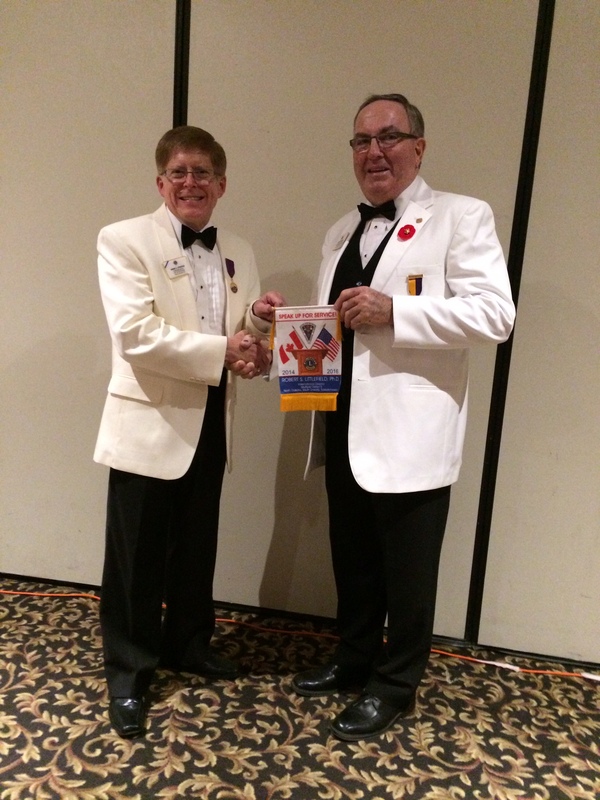 The other was presented by Lion Jim Sinclair of the Regina Beach Lions Club, a sharpshooter who was three-times deployed (Bosnia, Croatia, and Afghanistan). He described the experiences of a young soldier in 2006 Afghanistan through the eyes of the soldiers as they traveled across the country to confront the Taliban. After listening to Darla, I knew that she has a Lion’s heart so I asked her if she never had been invited to become a Lion. She shared that there was no Lions Club in her community, but she felt that service was a part of her life and that she would if she could. The soldier was a member of the Regina Lakeside Lions Club and through his family’s generosity; land had been donated for the Western Memorial Forest. These young adults were powerful examples of dedication, service, and recognition that each one of us can make a difference in the world. ID Robert presented PID Marvin and several others with friendship banners, Dakota Growers pasta, and Widman chocolates from North Dakota. It was very enjoyable to hear remarks from Past International Director Marvin Chambers at breakfast and from Council Chair Ken Wentz at the luncheon. Both are comfortable speaking and always provide listeners with an enjoyable listening experience. 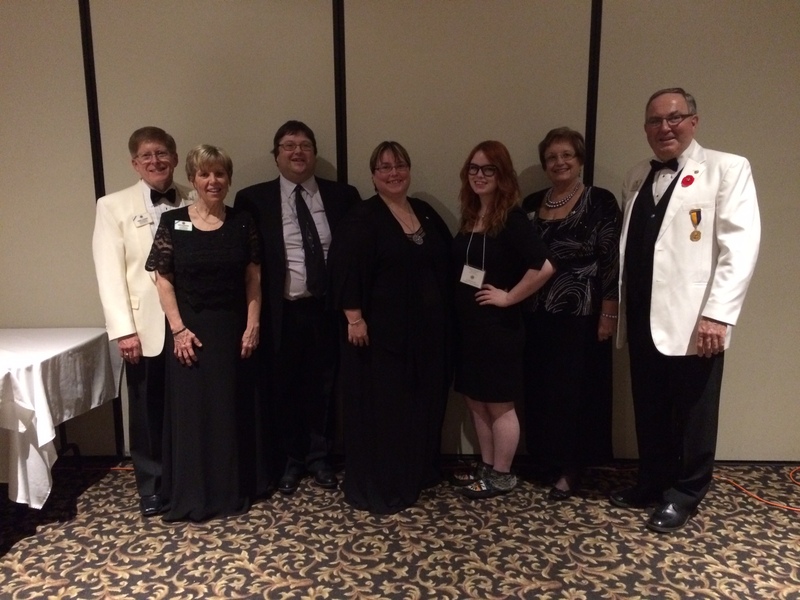 I was the speaker at the banquet on Saturday evening and my presentation in Moose Jaw was my first official convention speech. It was exciting be able to represent the association in this way and I am really looking forward to speaking to large groups over the next two years! When I finished, District Governor Murray Linner thanked and presented me with a check to be donated in my name to Lions Clubs International Foundation for the One Shot, One Life Measles Initiative. What a great gift! Another part of the program that I especially appreciated was the memorial service PowerPoint prepared by Lion Elizabeth Flodell. As the names of those Lions who had died over the past year were presented, a photograph of the Saskatchewan landscape was shown on the screen. I found this especially poignant because as I saw each photograph, I visualized the lives of the people who had embraced the values I share. When all is said and done, we are just people who get up every morning, do the work we are called to do, and return home at night to spend some time with those we love and prepare for the next day. Each of us is unique; we have our strengths and our faults. But we are all people and our lives mean something. The photograph of the railroad tracks leading somewhere, the grain elevator storing the harvest, the shores of Regina Beach where we might have walked or swam really struck home. The people who lived those lives were Lions just like me. We share a commitment to a noble cause—to serve those in need. It was a real pleasure to induct two new members at the convention as part of my speech: Mikayla Bamford from Fillmore Lions Club; and Jason Serviss from Moose Jaw Early Bird Lions Club. We raised them up and celebrated their induction into Lionism. New Lion Mikayla is pictured to the left of Lynne Chambers in the photo below. This week we are off to Butte, Montana and District 37N’s final convention as an international district. After July 1, 2015, MD37 will be redistricting. Montana will become single district and the area in Alberta will be combined into two districts of the new Multiple District C. District Governor Pauline Cooper and her team have put together a great weekend and we are looking forward to representing LCI at this historic event. Best wishes to all who serve the needs of others.